Check Out Our Whole House Special! 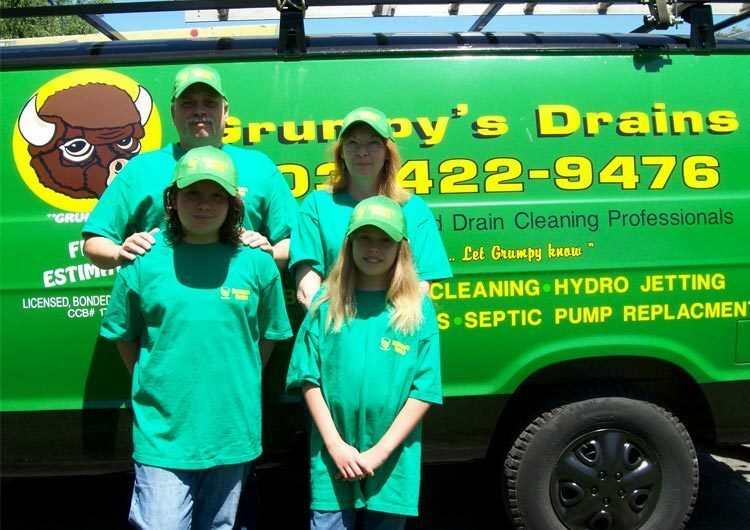 You can rely on Grumpy’s Drains for fast, friendly, expert service. What is the difference between a drain cleaner and a plumber? Grumpy’s Drains does not perform plumbing. We just clean your drains. There are two types of piping in your house: supply pipes that brings water into your house, and drain waste lines that take the water and waste out of there. Grumpy’s deals specifically with getting that stuff out of your house. Plumbing deals with the design, installation, and repair of the plumbing system. We just clean your line and get it back to where it was. The benefit of using a company that only does drain cleaning is that we’re very efficient in what we do and we won’t try to upsell you into a plumbing job. If you need to repair pipes, we can refer you to a qualified plumber, but that’s not our business. We just clean ‘em out. Try calling around to get a price for drain cleaning from local plumbers. Many won’t give you a price before they come, or they offer a super low price and then upsell you to death. At Grumpy’s Drains, we believe it works better for us and the customer if everybody knows what the price is upfront. We have flat rate pricing, so whether it takes 15 minutes or three hours to get your drains cleared, you pay the same rate. We hate high pressure sales (and you probably do too), so we would rather offer one fair price and let our reviews speak for themselves. We’ve won the Angie’s List Super Service Award every year since 2009, which we take a lot of pride in. If you’re not happy after we clean your drains, let us know what we can do and we’ll fix it. When people call us, there’s a problem. Water is backed up somewhere. Our method is to identify what the issue is, and solve it the best possible way. There are two main types of drain cleaning. You can use a cable (also known as a snake), which is a metal cable that will open your line and get things flowing again. The other option is hydro jetting, which takes a high pressure hose that will blast out the gunk and debris that’s blocking everything up. We’ll identify what the issue is and the best way to solve it. If everything in the house is backed up, that’s a good indication that there’s a problem with the main line. If that’s the case, usually we can go in and clear that up pretty easily. If it’s just one or two drains, we’ll usually start at the lowest drain of the two and hopefully be able to open both drains. Sometimes you just need to clean both drains. The lowest point where water isn’t flowing smoothly is where we go to fix the issue. A lot of the time, we’ll run into issues with the kitchen line and the laundry line. Maybe there is some grease getting mixed in with some of the lint or dirt from the laundry. When that coagulates, that can cause major backups. A cable will do a pretty good job of get things flowing again, which will do the trick if there’s enough water flow to flush everything the loose particles out. Otherwise, hydrojetting will clear everything out of your pipes and thoroughly clean them. That way, you won’t have problems again in two weeks once the hole clears. A clogged drain can happen anywhere where you have water. Most of the issues tend to come from the kitchen because food, grease, soap, and dull garbage disposal blades can combine to leave quite a bit of muck in your pipes. After 20-30 years of collecting small amounts of food every day, eventually the opening in the pipe where all the water flows through can get pretty narrow. Same with the bathroom, which picks up a lot of hair, and the laundry line, which picks up a lot of lint. It’s rarely one day that everything gets backed up; it’s usually years and years of collecting small amounts that gets everything clogged. 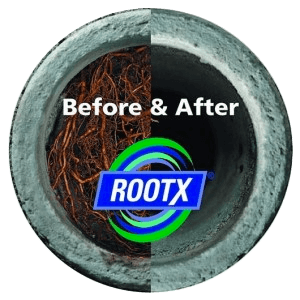 We’ll also help you with any drains on the outside of your house, which collect tons of organic matter, like leaves, dirt, twigs, and even dead animals. No matter what your issue is, we can come clear your drains and get the water flowing like they’re brand new. Hydrojetting has some pretty strong pressure, but it’s nowhere near enough pressure to burst your pipes unless there were some major issues to begin with. Hydrojetting can have anywhere between 2200-3000 PSI, which is enough to get most of the gunk out, but shouldn’t rupture anything. If there are issues, usually we can detect them beforehand, and it’s usually something you want to replace anyway. We pride ourselves on being a professional, courteous organization. 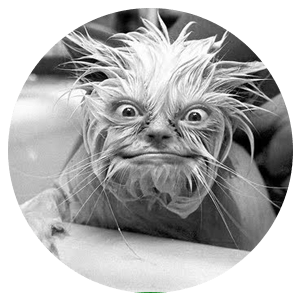 We get the question all the time, “How did you get the name Grumpy’s?” Well, with years and years in the drain cleaning business, we know that people tend to be pretty Grumpy when they have clogged drains. So we do everything we can to make it a pleasant process. We have flat rate pricing, a huge emphasis on customer service, and all of our employees are drug tested, background checked, and uniformed.